I’m looking at getting this jointer. I can’t tell if it’s 6 or 8. Anybody recognize it. It says gold series, but I can’t read the model #. Looks like 8” but it’s hard to tell for sure. It definitely has more beef than my Ridgid 6”. The width of the surface should tell you what size it is, I think. From the photo, it looks like it’s wide enough to be an 8”, but I’m used to seeing the 8” with red guards, and the 6” with the same guard you see in the photo. The black ridges are also the same as the 6”. Even a quick search shows all the 8” as red guards, as does Powermatic’s own website. So I’d say this is a 6”, unless someone has managed to get a 6” guard to fit on an 8” jointer for some odd reason. Everything by looking at size appears 8”, but when I did some google searches, it looks like the 6” jointers I found. Must be a really long bed. Ultimately I’d like an 8”, but longer bed would be almost as good on a 6”. Thanks for replies. Next question would be value, what should I offer. This is part of a whole set of tools I may buy. Likely I’ll resell most, but keep jointer and lathe. Is this one of the CL crazy listings? I would say 8” when comparing it to the length of the trailers drop gate. Unless it’s a really tiny trailer. Can’t tell for sure, but it looks like my PM54A. It’s a 6” with extra long tables. Maybe $400-500 if it’s a 6”. A little more it it’s 8”. It is indeed the PM 54A. I just came from looking at it. 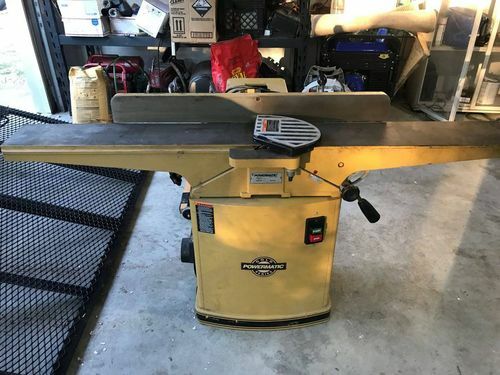 I will be going back tonight to pick up a Jet contractor saw, a Rockwell Delta unisaw, the jointer, a Jet lathe, an older lathe, a nice 14” drill press, a Jet mortiser, a portable router table with what looks like a porter cable 690, a bunch of clamps and a few other things. All for $1500. Sound like a good deal? $1500 seemed a bit high until I read the part about the “bunch of clamps”. That would have sold me on the deal also. Note : I added a nice smiley face emoticon to the above comment using my iPad, and as is always the case on this forum it does not show up. I can’t figure that one out. I agree with it being a 6” long bed jointer. Here is a LJ post for one that sold back in 2011. Asked $650 back then. I think I would offer no more than $500 for it by itself now. I was just looking at the ad. The jointer and jet lathe, and the jet planer make up the value of the deal. If its all still there, I think I would offer $1200 for the lot. Keep in mind are there any good extras for the lathe? No photos of lathe tools, and $1200 is a low ball price if there are good extras. Where the heck did you find this little treasure chest? That’s an instant shop you just bought for a great price. I added a nice smiley face emoticon to the above comment using my iPad, and as is always the case on this forum it does not show up. I can’t figure that one out.